Some big news for Canadians, as Amazon.ca has launched their new Fire TV Stick Basic Edition in Canada and beyond, priced at $49.99 CAD (Fire TV Stick with Alexa Remote–a different product–is priced at $39.99 USD in the U.S.–updated). This streaming media player lets customers access TV shows, apps and games on their TV, launching in over 100 countries and territories worldwide, building on Amazon’s launch of Prime Video last year. Previously, Prime Video was limited to smartphones, tablets, the web and smart TVs, but now customers can plug this HDMI dongle into any TV and start streaming. Fire TV Stick Basic Edition lets customers in Canada access content from various providers, such as Amazon Prime Video, Netflix, Spotify, Youtube and more. The tiny and portable Fire TV Stick plugs into your TV’s HDMI port and once connected to Wi-Fi, you’ll be able to “start streaming in minutes”. 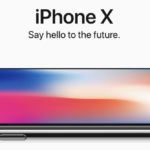 The media player is powered by a quad-core processor and 1GB of RAM “for a fast and fluid streaming experience,” while it includes 8GB of storage to download apps and games, over 802.11ac Wi-Fi. Bluetooth 4.1 is also supported to connect the included remote. The Fire TV Stick Basic Edition supports High Efficiency Video Codec (HEVC) for 1080p HD streaming with Dolby Audio surround sound. The default language for Fire TV Stick Basic Edition can be set to French, Spanish, Italian, Brazilian Portuguese, German, or English. 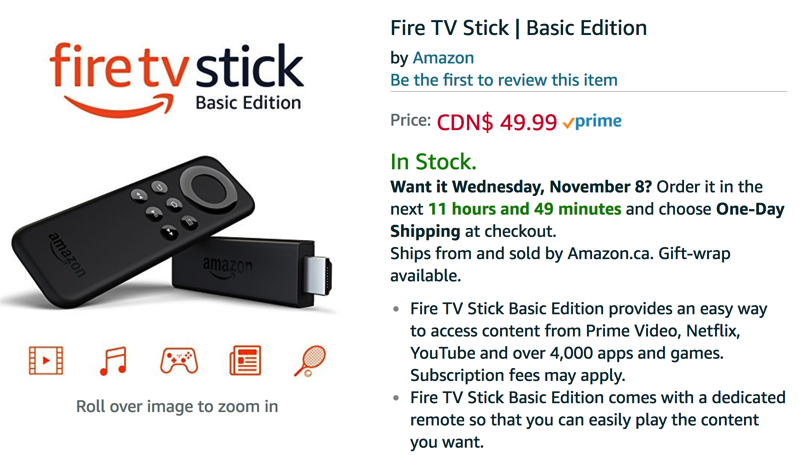 Fire TV Stick Basic Edition costs $49.99 CAD in Canada, which is a no-brainer to connect all of your TVs to Prime Video, YouTube and more. Users in the United States see their Fire Stick come equipped with an Alexa voice assistant powered remote, priced at $39.99 USD. But for now, Alexa has not launched in Canada. There’s also a 4K HDR version of Fire Stick for $69 USD, which could eventually reach Canada at some point, too. Amazon Fire TV Stick Basic Edition is available for purchase today on local Amazon sites in Canada, France, Italy, and Spain, with Brazil and Mexico coming soon. Other countries and territories can purchase the Fire TV Stick Basic Edition from Amazon.com, shipped free worldwide. Click here to buy Amazon TV Fire Stick Basic Edition for $49.99 on Amazon.ca today—shipping starts tomorrow.